Everyone knows I am always on the lookout and trying new breakthrough products that can help protect and improve hair length. 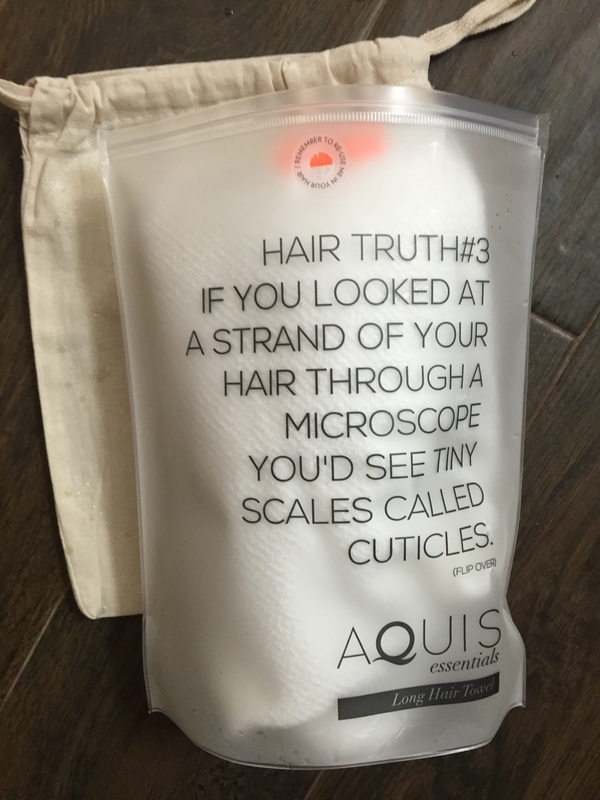 I recently stumbled upon the AQUIS HAIR TOWEL and let me tell you, its AMAZING (praise emoji hands here). I had such a great and large amount of feedback on my last post of my favorite hair products I had to share this with you and better yet, you have the chance to win a FREE AQUIS hair towel by entering the giveaway on my instagram. 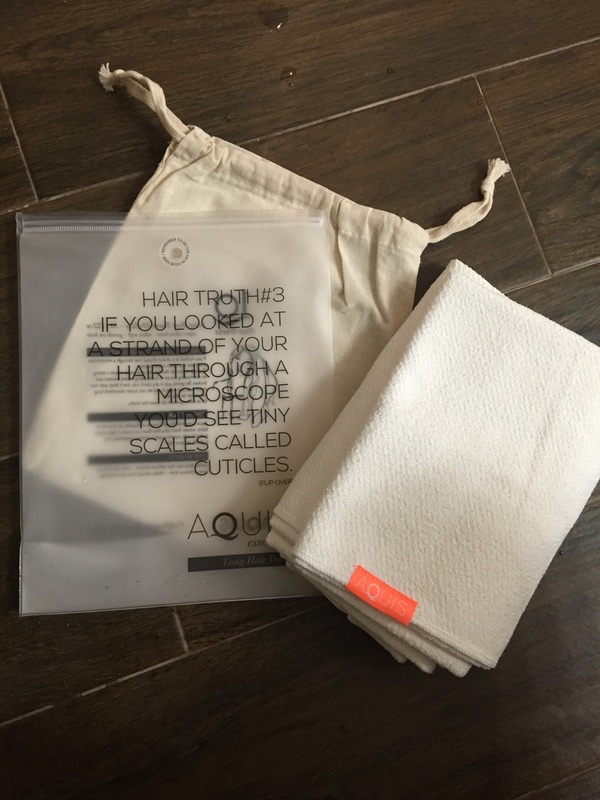 So let me tell you a little bit more about why the AQUIS hair towel is way better than any old towel you have hanging around. The secret to healthy hair is drying your hair naturally—but as quickly as possible. 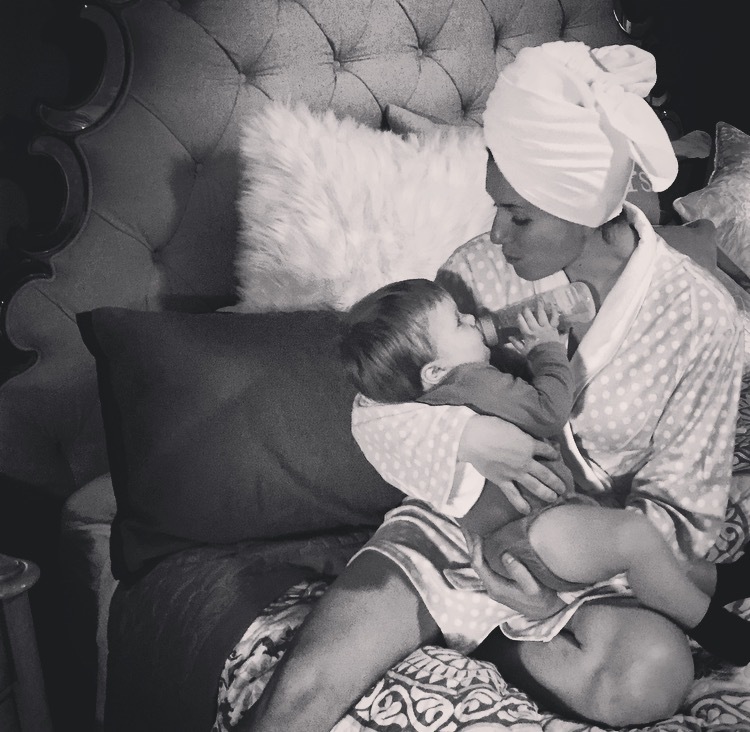 Being a mommy, I am always running around and rarely have time to actually dry my hair because it is so thick it takes me almost an hour just to get it dry with a blow dryer. The AQUIS towel speeds up the drying process! As soon as I get out of the shower I throw my hair up in the AQUIS wrap and within 5 mins all the dampness is out of my hair! ITS AMAZING. It seems to really leave my hair feeling smooth and not so dry. I like to spray a few pumps of “its a ten” leave in conditioner into my hair before wrapping so it can soak into my hair while drying. After falling in love with the towel for its speedy drying process I decided to read up on why this towel really can improve the health of your hair and stop your hair from breaking off. Below in bold is some info from http://www.aquis.com that really shocked me and made me realize how damaging a regular towel can actually be! YOUR HAIR IS NEVER SO VULNERABLE AND DAMAGE PRONE AS WHEN IT IS WET. That’s why drying your hair naturally can make more difference to its health and appearance than any other method. Hair is never so vulnerable as when it is wet. If you rub it at this delicate point you can do damage that no serum or shampoo can repair. Creating dull lifeless hair that is prone to frizz and breakage. And if you blast hair with a hot air dryer to dry it, you can do even more damage. Drying hair gently is the key. But this is only possible with a towel with incredibly high water wicking capabilities. Aquitex also ensures that your hair dries fast; because let’s face it – who wants to be a towel head all day? Unlike human skin, which is a living organ, hair cannot repair itself. So treating hair for optimum health and vitality requires understanding how to avoid damage. First, the basics: Think of the outer layer of your hair (the cuticle) like tiles on a roof—overlapping layers of cells that provide a tight seal for the vulnerable middle layer (the cortex). When your hair is healthy, the cuticle has a smooth surface, and all of those perfectly overlapping layers reflect light, creating the appearance of shiny, normal hair. When the tiles are rough or damaged, your hair looks dull and lifeless. So how can you keep the fragile layers of your hair intact? Heat styling and rubbing hair vigorously can damage the inner cortical layer, irreversibly threatening the integrity of your hair. Surprisingly, so can sitting around with wet hair. Because the innermost layers of your hair are incredibly thirsty), they soak up water and cause your hair to expand from the inside (as if the “shingles” were glued onto a balloon). If this happens repeatedly and for prolonged periods of time, the pressure can irreparably damage that all-important protective shield. The secret to healthy hair, then, is drying your hair naturally—but as quickly as possible. So go enter the giveaway on my instagram and be entered to win one of these amazing towels! The giveaway will only be open for 48 hours so make sure to tag a friend and follow @aquishair! The winner will be picked at random. ALSO, I have teamed up with AQUIS and have created a DISCOUNT code just for you! You can get 15% off by entering the code WHITNEYSCOTT15 at your checkout. This code expires December 31st. I hope you all can get a AQUIS towel and see the difference! I would love to hear your feedback! I would love to this !! Kathy, Definitely give it a try! Elaine, i bought it off http://www.aquis.com and you can use the discount code on my blogpost to get 15% OFF ! Hi Sophia! definitely give it a try along with the its a 10 leave in conditioner! dont forget to use the code for 15% off of your towel! My is extremely dry no matter how many different kind of conditioners I’ve tried. Is this towel very expensive I would like to try it if its not. I never really have been lucky at winning anything so what would I have to do to purchase one if it affordable For me to do so. awesome! are they AQUIS brand? I have made it a life’s work to treat everything that God has given to me as the wonderful gift that it is. Whether it is my skin, my hair, my nails, it is up to me to “treat” each of these gifts with the utmost care and concern. I was amazed to read about this Aquis towel and will assure you that this particular piece of magic will be utilized to it’s fullest, and in addition, I would be happy to share a before and after look using the towel itself. I am also very interested and excited to see how this works with chemically treated hair, and the dryness that can occur when using products that bring my hair up to it’s beautiful color! I want this towel and I simply can’t wait to see how it works on my tresses!! Willing to be yours forever, little towel!! That’s a great way to dry my hair. I always struggle to keep my bath towel in place to dry my hair. Then it gets heavy and pulls my hair. I wish to have a aquis towel too.